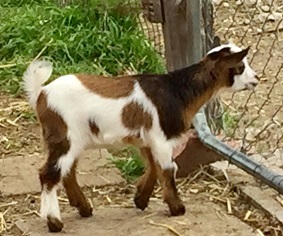 This goat is ideal for the backyard farmer, providing both milk and meat. 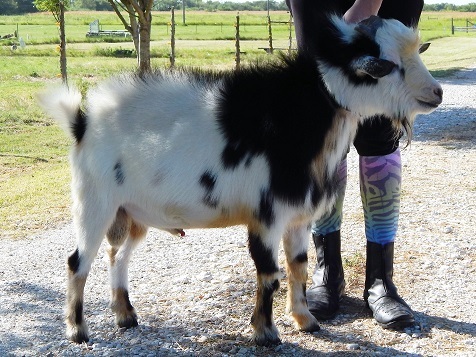 Standing only about 19 inches tall, they are easy to handle and make a good goat for someone just starting out. The average milk production a day is about 1 quart (1 Liter), over an almost one year lactation period, some milk even longer. Nigerians reach their peek production at about 3 to 6 years old, milking up to 3 quarts a day.Goats milk is sweeter then cows milk and easier to digest. Proper feed is important. Plenty of fresh clean water, 14-17 % protein (grain), sudan hay, pasture and shrubs. A mineral salt lick that has copper in it is essential. Baking soda is needed to help digestion. Housing:Nigerians do not like the rain! They need a shelter for those cold and wet days and shade in the summer. Fencing: 4ft. high goat fence or higher with 4in. x 4in. squares or smaller is a good choice. Bend about 4 to 6in. of the fence –on the bottom- toward the out side on the ground, so no dogs or coyotes can dig through. About 4 to 6 in. from the top of the goat fence run electric wire with about 5,000 volts or more. Do not overcrowd your goats. This will lead to disease and parasites like worms. Worms do not pass through the milk but are very hard to get rid off and can make your goats very sick. It’s best to have 2 or 3 fenced in areas for the goats, so you can rotate them. Price from $250 to $350 ADGA and AGS papers! Thank you Michelle and team from the Houston Children's Zoo!